World welcome to the podcast Trevor. Thanks Harlan happy to be here. Yeah, thank you for joining us. Really appreciate it. And I'm really excited to talk to you about dropshipping high-ticket items. And so it's an area that I don't know a whole lot of of myself. So you're going to be in lighting enlightening as well as our audience is so stuff. We going to be good time. But you know before we kind of get into all of that, why don't you tell us a little bit about yourself and how you got into what you're doing today? Yeah, so like you said and. School, I started selling things online. It was actually thanks to my photography teacher. He had some old photography equipment and this is right about the time when everything was switched over to digital photography. And so he wanted to sell the old photography equipment on eBay any thought what a great way to have the class to a project and kind of teach us a new skill set. Just selling things online because he likes to sell a lot of stuff on eBay. So he had the whole class take pictures with his digital camera, but all the old photography equipment we listed it on eBay and that's how I learned how to make kind of sales pages and descriptions of products and stuff like that and and do market research and find out how much a product would be worth online that kind of stuff and yeah, we successfully sold the equipment and there you go and that was my first foray into e-commerce and then and then from there I thought you know going through college. I wanted to make side money, you know, and you have little hustles here and there so I sold textbooks on. Is Andre I need anymore and I so I did garage sale flipping and yeah, I used to take stuff at my job where you know, I worked in a warehouse and they had a returns department that I managed and they were basically throwing things away that were perfectly good. Just to kind of avoid dealing with people that wanted to resell it and stuff like that. And so I asked the manager I was like hey, do you mind if I just dig through the dumpster and grab some stuff out this perfectly good. He's like, hey, just don't let anybody see do it like all right, so I went and grabbed some of the stuff out and looked on eBay and it's worth some money. So I sold it and get doing that kind of stuff and I actually ended up talking to one of the the clients that I was working with it that job and he's an entrepreneur he saw that I wanted to become an entrepreneur and kind of get out of the day job get out of the Rat Race, you know. Start living more of a. If I want to get rich, but like I just wanted to live a better lifestyle instead of being kind of stuck in a dead-end job and working in a cubicle and stuff like that. So it's talking to him and we were trying to come up with ideas on what to do and he heard about Drop Shipping from somebody, you know, it's a it's a way to sell physical products without having. To stop them yourself that having to have the inventories. Somebody else has the inventory in a warehouse somewhere and you just use them as a fulfillment warehouse. And so we kind of got started. We I tried to start a skateboard brand. That was my first kind of thinks. I'm a skateboarder and didn't really work out because it's very low cost items that profit was very low and the the industry is based out of course skate shops and stuff like that. So it's a really hard place to do Drop Shipping, but we've looked around a different product niches and we actually came across a really trendy nature the time he was actually. Driving around a lot. He's a locksmith and he's driving around a lot in North Hollywood and North Hollywood at the time around 2010. There was a lot of kids writing these really cool looking bicycles around and he noticed that and he said, you know, what are those things and we checked it out online and it turns out they're called 60s or fixed-gear bicycles and we looked it up and it's actually training really really strong back then and I we decided you know, why not figure out how to do this. So we found a supplier in La that was actually willing to drop ship for us without us having a physical bike shop. So that was kind of a big thing. We got an accountant. I figured out how to do an e-commerce store and we got her we got our first sale and that was the big aha moment. I was like, wow, it actually works, you know the moment I got that sailing in I think it went through me like 30 bucks or something 300 dollar buys. Wow, I'd okay we can do this. So that was the that was the confirmation. You knew at that point. It's possible and the sky's the limit from from there on. Quick side note. Yeah, I kind of had a flashback when you mentioned the dumpster diving store. I had a in my early college days. I think maybe my freshman and sophomore year. I went back home for my summer break in the Chicago area and I got a temp job. So I was having trouble finding like a little summer position. So I did some temping and one of the jobs was a baseball card company. Had one of their cleaning staff accidentally threw out some type of film or negative to one of the baseball cards or whatever. This was he I'm kind of dating myself because nowadays everything's digital. But this was I guess kind of at the transition period where things were kind of. Still on actual film and not just digital media. And so they one of the cleaning staff accidentally threw out to out something that I think was pretty valuable. So they hired some temps to go dumpster diving and it was like a huge kind of container size dumpster. I mean, it was almost like a huge boss really but it was like full of trash or whatever. I'm one of the warehouse and we were digging and digging and digging I think for several hours and still didn't never find it. To this day. I don't know if they ever knew what happened to that film. But I think it was a pretty big deal for them because they you know, they hired quite a few temps over a over a period of days actually to look for this film and we never did find it so you never know so I kind of had a flash back there when you mentioned the dumpster diving. So I guess you never know what you can find in a dumpster. I guess just goes to show that it's true. So we appreciate that, you know, given that background and of. So your bread and butter is Drop Shipping and making money online doing that. So I'm the key thing that you have to think about when you're doing Drop Shipping and you are nowhere expert in that is creating a sales funnel. So, you know, you've got to have a constant flow of people coming in to your to your site. And so why is this really so important specifically? Drop Shipping, I think that's the core of any business and with dropshipping. I think it's really important because obviously you don't have a retail storefront. So like you consider like a retail storefront, you know, you're going to have traffic almost automatically it depends on where you are. Obviously if you're in a mall for instance, then you're gonna have people walking by if you're going to be on a street you're going to people driving by, you know, I mean, it's like people will just see your store and if they're interested they'll come in but it website it's not like that, you know, you have to really put yourself out on to these platforms and so to drive. Your website there's a lot of different methods to use. Mostly. It's pay per click advertising because that's going to get you to the top of the search engines right away, which is very difficult to do these days with Organic search rankings. You can do it in certain long tail keywords and certain niches that aren't as competitive but still it takes time. And so this building a website alone is not going to get you anywhere you have to drive traffic to it. So we like to use Google shopping ads. We like to use Google search text ads. We like to use Facebook ads. We like to use Pinterest Pinterest is a great free traffic. First YouTube videos are great my product review videos and things like that and blogging blog posts. And of course SCH IO and and keyword targeting and stuff like that with and going for the organic rankings and backlinking and all that stuff still works great, but. Google shopping at sense to be the best traffic source for high ticket dropshipping specifically when you're talking about products over like $300 where it kind of takes a longer sales cycle for somebody to decide to buy that product. So we usually go for the long tail keyword searches people that really know what they want to buy. We've been really high on those terms. Whereas on the short tail stuff the kind of generic keywords the product category kind of keywords. We've been a bit lower on that because it's not really a place where somebody's ready to buy it. We look at a lot of our data and how many sessions they spent on our website how many times I came back to it and oftentimes will find like people spent, you know an entire month coming back to our website like six or eight different times before they finally made their purchase. It's not uncommon with high ticket products. There's a whole kind of a cycle you have to go through in your research before you decide on the particular product and then of course which store you're going to buy it from so yeah, it's really important and that's just on the traffic end of it. And that doesn't even cover the whole back end which is the most important part in my opinion. Obviously the front end is important to get people to your site to make that initial cell, but if you don't have things on the back end to upsell and cross-sell and and get that person coming back for more and referring your business isn't going to be fully profitable in the back end, you know, all that all that ad spend is you're really only covering the ad spend plus a little bit but if you have you know services and accessories and things like that, you can upsell with the product and then of course, maybe ask them if they want to buy two or more and then from there it is, you know, bring them back with email marketing bring them back Facebook, too. In qasim to refer their friends ask them to make testimonials all these things can help in the backend bring ourselves up, right? That's awesome. Now speaking of the Google shopping ads for listeners are not really familiar with that. The Google shopping ads are if any time you search for a particular product. For instance. Let's say I was searching for high-end wireless headphones nine times out of ten. I'm going to see the little Snippets of the different online retailers that are selling it or sites that are selling it where it shows a little. The picture of the actual product shows the price and then there's a link to the site. And so with those those are specifically pay-per-click or those things that you can rank for organically. Yeah. Those are only pay per click and an interesting thing too. Because you know traditionally search text ads at Google which is always been their main pay-per-click kind of advertising is a keyword targeting. Add so you get to choose which keywords that you show up for whereas with shopping ads. It's the opposite. So they choose the keywords you show up or you actually have to tell them which keywords you don't want to show up for so it's a different kind of a beast to manage and you have to do it a specific way to make it profitable so that there is a specific kind of a structure to the campaign's you create and it's pretty complicated, but we've come up with a system that works really well for high-ticket Drop Shipping and that's the kind of thing that I teach to my students know and that works really well for us as well. Yeah, that's great. So no, you know you also mentioned that as far as the cell funnel is concerned. You mentioned a lot of different things that you have to do really all at once, you know to drive traffic and to continually grow your funnel and a lot of people these days. I'm constantly hearing the term of omni-channel marketing approach where you doing a little bit of everything you're doing the Google. And postings or the pay per click on Google. You're also doing regular organic listings, you're trying to actually improve your organic listings by doing blog posts and getting a link out there, you know, so you doing a little bit of everything and that's definitely something that's key. I think like you said regardless of the type of business. You've got to have that constant sale funnel. It's just a difference with the high ticket Drop Shipping out of you don't have a storefront is no other way. No other source of traffic but the online traffic now if somebody's just really kind of jumping right into it and doesn't really have any experience with doing it at all. What would you say are some good examples of high ticket products that have a good return on that you've seen success with yeah sure. Now there's tons of products you can sell online obviously, but the best. Specific like highest return products can be found in the strangest niches sometimes and you wouldn't even have thought they existed but things like compostable toilets for tiny houses or something like that or even like solar panels and solar gear that kind of stuff is very profitable strange types of grills. Like well for instance pizza ovens are pretty popular and profitable and and pellet grills and things like that. I whole list here. There's like wine coolers are very good kegerators, you know home bars things like that infrared sauna. Our steam showers and the bathroom. Those are quite profitable the days and bidet toilet combinations and generally speaking. We don't like to really go after furniture too much because Furniture the suppliers tend to not enforce Matt pricing which is kind of a big deal in high-tech adoption and map stands for minimum advertised. And what happens is if there's a lot of online retailers selling the same product and there's no minimum advertised price policy by the supplier. Then a lot of them will start undercutting the other retailers until they get down to really close to cost and then the people that are close to cos are going to get the sale probably just because it's cheaper and nobody makes any margin anymore. So it's hard to you know, spend ads on send them to Furniture listings from suppliers that don't have Matt pricing and still make a good margin. So what we usually do is we work on. Appliance can sort of niches things that are generally Electronics sometimes not but they're just kind of unique products and they have Matt pricing they come with a SKU number which is really important and usually products with model names and unique brand names and things like that things that you know, when you type them into Google that product is going to come up for sure. It's not like some weird generic name. Those are really easy to rank for really easy to show for in the search and they're less competitive than like the main thing. You'll see on my way Fair. How's that comments like that? Some other examples would be like electric fireplaces some like a lift chair for instance a very interesting category, you know senior citizens. They said at home they can get up off their chair. They make motorized lift chairs for them, which is kind of cool. And yeah, just you know, strange little niches you never would have thought about okay? Okay, great. Yeah that definitely helps them make sense. I see what you're saying. You want to you know? Stick with a particular Niche where you know, it's just not overcrowded and you know, it's going to be a high-ticket item and it's something that when you do a search you're going to see that product you're not going to find like you said one of those sites that just kind of has a whole lot of inventory of things that are like it now as far as the marketing efforts are concerned once your you got yourselves funnel. Going to have to you know things come in and we're actually do you see the sales funnel beginning? I mean got to get some can start a number of different ways and then where does it really end or does it or does it end is it is it like. You know continuous would what's your take on that? Yeah, they'll definitely begins usually at the pay-per-click traffic sources for high ticket stuff these days it didn't used to be like that back when I first started 2010. We weren't doing a lot of PPC we didn't have to it well in our Niche anyways, I'm not sure other niches probably you still had to back then but but we were driving a lot of organic traffic just with YouTube and Pinterest and Instagram things like that and making tons of sales just your that kind of stuff. Whereas the Landscapes changed quite a bit in the last 10 years. And so. If you're not on pay-per-click, if you're not in the shopping ads and stuff like that, you know, it's really hard to compete in a specially in these really competitive categories Like Home Goods and stuff like that. So yeah definitely begins in the pay-per-click world. But again, you can you can drive traffic through Pinterest and YouTube and then to answer answer the question about where it ends at your right like it really shouldn't ever end. But I mean you have to think about like every step of the way matters, you know, and so like the product page matters a lot and so you can have the product itself, but you should also have it stacked with an offer I usually suggest like people. In expert secrets.com secrets that kind of stuff they can understand like what an offer really isn't what like a value-added really is because you can take the same ideas that people used to sell digital products and products online and apply them to selling High ticket physical products, whereas, you know, you have a lot of things that go along with these physical products like you have to deliver the products to provide customer service on each provide tech support and all these things you can talk about in the listen as if it's like worth something. So like lifetime tech support, you know, a hundred bucks. R-value is $100 free, you know. For free delivery or free shipping and all these things to be stacked up like it's a philosopher. So so that's kind of part of it and then you can also upsell accessories which I highly recommend doing the margins usually higher if they ship from the same supplier. It doesn't cost any extra to ship. Usually you have the product page do it in the cart page and the checkout usually is just the check out but then after the check out on the thank you page. Then you can upsell more you can have a video that explains to them. You can have like a membership program for your website or you can you know, you can do a number of other things and then of course. As the emails you can send emails after the cell that gets them to buy more stuff from you. You can retarget them with Facebook ads after the sale that gets them to buy more things from you. Just like you can email similar thing with YouTube. So yeah, there's tons of different ways to do that and I highly recommend if somebody's going to get into this stuff. Don't start too wide as my biggest tip for somebody is starting very narrow. So I would like one product category and go deep as possible into that category of all these different marketing methods as many suppliers as you can in one category because you can really do a lot in one category. You have a very profitable side to sing like wine coolers. For instance. I seen websites that do fifty to a hundred thousand dollars Revenue per month, you know at around I would say 15 percent average maybe a little bit more profit margin net after marketing costs. And and so when you're when you're doing that volume you can reinvest in Virtual. So like that so and focusing really deep in one category can go deep in the marketing deep in the retargeting and all that stuff. And that's when you really start to build profitable business doing that going to think. Okay, great great at some awesome advice. Now you mentioned as far as the marketing efforts are concerned different things that you can do and I think right now like you said the landscape has changed a bit. The focus really is on the pay per click marketing pay-per-click advertising it that you have to do. You know, we're really now also in the age of. All of these available marketing tools, you know, there's so many marketing tools that are available that can help you, you know, optimize your funnel. Do you have any go to tools yourself that you use specifically for optimizing your funnel and driving traffic? Personal views Shopify for our e-commerce platform and so easy to use and get some managed e-commerce solution. So they manage the SSL they manage the domain they managed to hosting. So if it basically it really never goes down and if it ever does go down they deal with getting the website back up so you don't have to have a developer on hand to do it. So it's really nice and it's also really easy to use and it works really fast. So we used Shopify. We also use the shop demise theme which the shop demise theme is a theme that's not available in the Shopify Marketplace. It's separate and I've. It for a long time now and I've actually done reviews on it and stuff like that and it's my favorite theme because it has so many features built into it that you normally have to like custom ad with a lot of different apps and Shopify has so that's what we use it converts really. Well, it goes really fast. And then what we use is a is a bunch of different apps. So like for instance believe isn't happen the Shopify store called Google shopping feed app. And that is the app that you will link your products catalogue with Google merchant center, and then you'll set up Google AdWords for good. Now called Google ads from there. So that's really important that you do that and if you have to get your catalog on the Google merchant center first in order to get the Google ads and once you do that, then you can drive traffic the shopping ads to your website and with high tickets. Basically the number one traffic source for cold leads and. That's really good for that. And then when you want to get on the back end, so klaviyo we use klaviyo for email marketing. They have a really great flow structure and templates and stuff like that built into it. So it's really easy to set up that's really important. We use shoelace for Facebook retargeting ads shoelaces really cool because they have a. Series of different retargeting ads based on the number of days somebody has been exposed to your website. So they don't get the same ad over 30 days. They get a different at every couple of days or whatever. So it feels a little bit more like email marketing like you're having a real conversation with somebody so shoelace is really good. And then on the back end we use a thing called zip if I simplify was created by Ezra Firestone and who does Smart marketer incredibly Commerce entrepreneur and he teaches people how to do this kind of stuff to the simplifies the software he created and there's. Reasons of its provide Pages which allows you to create squeeze Pages for lead offers the generators and that's really good for like, you know, basically getting somebody from a kind of a top of the funnel and middle of the funnel and then diving them down into the bottom of the funnel, you know through various sources like YouTube and Pinterest usually free traffic or blog post that kind of stuff really good content marketing stuff there. It's also really good for going out customized product pages drag-and-drop Builders and stuff like that and customized collection Pages customize blog post. So it looks really good and its really really in depth by using. I'm all our sites and then they make another tool called Zipper by one click upsell, which is really cool. And so one quick upsell allows you after the sale is made to allow that person to add a accessory or whatever you want them to add to that order with one click instead of than having to go back to your store go through the whole checkout process again, so it lubricates the process of the sales funnel happening. And so if they didn't choose that accessory on the product page of the car page then they get in. It's to do it again right after they check out which is which is really cool. So those are some of those are some great tools that we use we use a lot more obviously, but the main ones aren't you got? Yeah, that's great. I appreciate that. They're listing of tools and I definitely agree with you on Shopify as a platform as e-commerce platform because you know with. With our software. I'm nice our affiliate software. We've had a relationship with Shopify for quite a while. We're featuring our app store and have been for a long time. I totally forgot to mention you guys. Yeah. No, we use a nice start for affiliate stuff. So I highly recommend you guys you guys have a great platform and an affiliate marketing is great for referrals and stuff like that. Anybody else out there is thinking about trying to drive traffic back to their store email marketing is great. But if you don't have a referral program, you don't really have a great way to incentivize somebody to do it and I'm nice. There's really cool platform. So I had to recommend your guys. Where yeah, thanks. Thanks, and I appreciate that. Yeah, it's you know, and with Shopify with kill people because we get customers from all over all of the world with different different platforms. And when you see all of these other shopping platforms and then you kind of look back at Shopify. You really see the power that they've created and you know, just the overall ease-of-use you mentioned their themes. Really straight forward you don't have to worry about the uptime things like that. And I really say hands down there definitely leaders in it and the game. So yeah, I would definitely second that as far as saying chakra Pfizer's, you know, definitely one of the number one e-commerce shopping cart platforms for sure. Now, of course, we did talk a lot about again the pay per click advertising and you know these days since you know, we know a lot of. Is going to a lot of your budget is going to go towards that the big question that I know I have and I know some of the listeners are going to have is is there a recommended ad spend budget to be successful and you know, especially if you're just if you're new to this you just getting into this, is there a specific budget amount that you recommend? What's your advice on that? Sure? Yeah, and there's a lot that goes into my answer here. So I'll try to make sense of it as much as I can from a foundational aspect first, but it really has it really depends on the amount of products you have in your store first and foremost, if you have thousands of products in your store and you're running ads to all these different listings going to cost you a lot more and you're not going to always be making sales on all your products. So what I usually tell people in recommend in the very beginning especially is to do a lot of research and your competitors and also ask your suppliers to find out what the. Selling products are out of their entire catalog. So if a supplier has the catalog of a hundred products find out what those top 10 or 20 best sellers are in only upload those to your website first and then run ads to those products and optimize those products as much as possible because if those are selling products nurses our catalog doesn't sell as much what's the point of uploading the rest of them? So you'll lower your ad spend that way because cost per click on shopping ads in non-competitive nicias can be like as low as like 30 to 50 cents, but in very competitive niches it can be as high as like three to five. As per click so, you know, if you're if you're trying to compete in a very competitive Niche and you have hundreds and hundreds of products that you're trying to drive traffic to first of all, it's really difficult to go through an optimized hundreds of products and be very expensive. We write descriptions at Munich pictures. Do you know sales videos all this other stuff? It's a lot easier and less expensive to get it done on a small selection of products and then the ad spend in the in the budget to be a lot less that way so, you know, it really just depends on your catalog size. But if you're driving traffic to your website with shopping ads and you have all this other remarketing going on you might be spending no close to a hundred bucks a day when you have you know, a big catalog a big store going on, but you should be making at least $500 a day in profit with a hundred dollars. They had spend that's usually about a guy for is like a 5x return on ad spend at the minimum. So that that's what we ain't boring with high ticket products and you sell it three to five thousand dollar product, which is a really good sale. You're getting back probably 600 to 1200 dollars. In profit and gross profit that's before your marketing cost. So, you know, that's when you're profitable. Yeah, that's that's pretty good and some that's some great advice because I know kind of just jumping into it. It's kind of hard to determine. You know, how much do you need to really put into it? And you know, like you said depending on the keywords and things that you're bidding on you can you can burn through a budget really quickly, especially at the beginning if you're not quite sure. You know what to Target which every at right we really appreciate everything that you've Enlighten us on with regards to the high-ticket Drop Shipping its but definitely been great. It's not an area. Like I said, I don't know a whole lot about but I'm always curious as to various niches and I know you've definitely given us a lot to think about and for those people that are interested in and kind of pursuing it you're definitely though the way to go to to do that as far as getting advice and as far as the courses that you teach on that. On so Switching gears here. I just wanted to ask one final question which one thing that our audience would be surprised to know about you. Well now it is I was just thinking about this but I'm like half covered in tattoos now man. I've been going crazy with the body art lately the last year so it's funny because like I literally haven't even gone to see my family and I'm thinking when I go back to see them they're going to be like, what is what the heck happened to you, but you guys can check out my Instagram. It's this Trevor at Trevor fender on Instagram. You'll see all my tattoos and. I got some full sleeves that I'm working on. I already got my right arm down and getting my left arm next month and my legs are working on Tuesday. Yeah, it's pretty cool. Yeah, that's awesome. Yeah, it's really amazing how how tattoos have really just exploded over the past few years. Yeah. It's so cool. Yeah seen so many people with some really intricate interesting art, you know on their arms and I see these full sleeves and I'm like, wow, I've thought. Myself. And I think it's a point. I may go there. I'm a mess start small. It could be very painful recommendations. I can refer you to a good tattoo shop in Bangkok and also Molly. Yeah, that's as much as I know at some point. I do want to travel out that way. So yeah, definitely be sure to hit be sure to do that if I'm a silent as a really cool tattoo style probably. People don't know about it, but it's called the sake and tattoo and it stands for his stock is a tattoo style where they actually tapi with a long needle instead of it with a machine and it really hurts. Like you're actually getting kind of stabbed a bunch of times and I got is kind of like a like a prayer that they do while they do it. So you get it done by a Buddhist monk at a temple or even like like a Buddhist monk like they called Anna Jarvis kind of a student and they do it at a tattoo shop, but. It's a beautiful style tattoos and it's done in like an ancient Khmer language that only these Buddhist monks know it's not really well known language anymore kind of a forgotten language. And they do this really intricate designs and something that I have a lot of them on my body as well. Just because I just think they're so beautiful is it's just like the our work. I used to Domino the kid or something like that. It reminded me of that. So it must eat meaning lots of like protection and things like that, you know and and strength and courage and things, you know worked into these tattoos of tigers and and whatnot. So really cool stuff a lot of noise I Fighters and like yoga people get these tattoos. That's awesome. I had never really heard of that but it sounds painful, but I guess if your. The pain you're gonna have a pretty good outcome when they're something else. If we think about that well great. 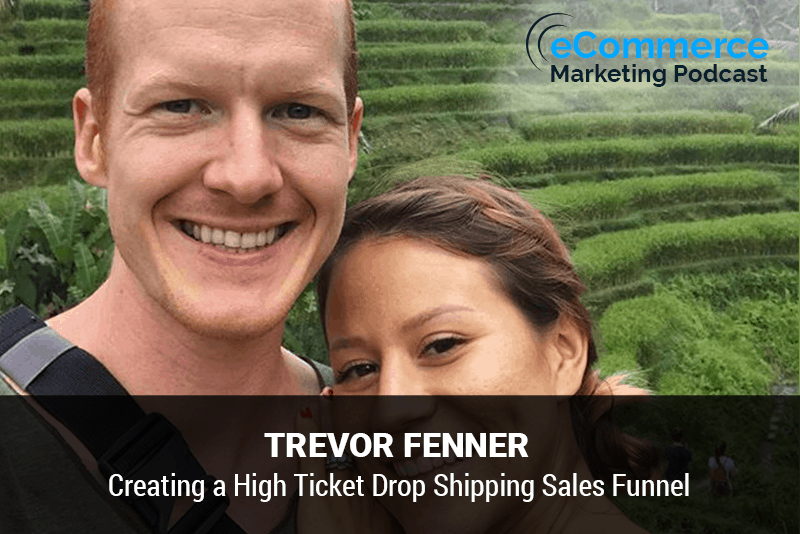 We has ever been a pleasure having you on the the e-commerce marketing podcast Trevor and you know, if any of our listeners want to get ahold of you. What is the best way for them to contact? Very odd. So the websites e-commerce Paradise.com. I do have a podcast you can check it out see Commerce Paradise. I take a job shooting podcast on the iTunes store or just go to e-commerce paradise podcast.com and I'm on Facebook. I'm on Instagram on YouTube as well Ecommerce Paradise. Oh, yeah, you can find me anywhere. All right, sounds good. We'll definitely do that. Look you up in the see what tattoo you're gonna get next. Thanks again for joining us. We appreciate. Thank you for having me. I appreciate it. Thank you for listening to the e-commerce marketing podcast. You need to get more feedback and reviews from your customers and improve your customer retention. We have made it easy to do all of this with our Advanced customer feedback software just visit get OS i.com forward slash feedback and sign up for a free trial today. That's get OS i.com forward slash feet.